South Korea’s Minister of Foreign Affairs Kang Kyung-wha on Wednesday urged Japan to make a “prudent” response to rulings on Japan’s wartime use of South Korean forced labor, in a phone conversation with her Japanese counterpart amid an intensifying diplomatic row. 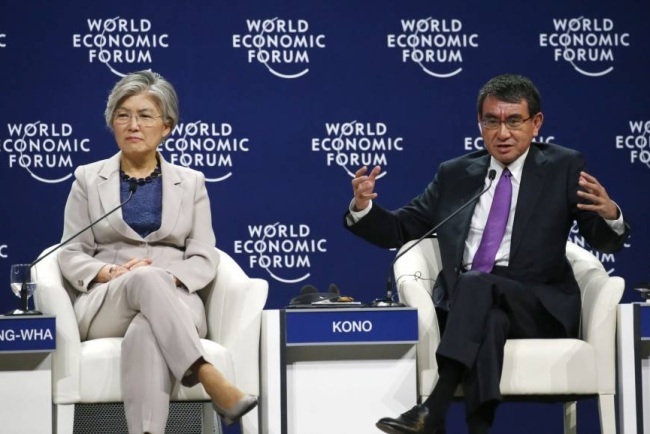 According to Seoul’s Foreign Ministry, Kang Kyung-wha and her Japanese counterpart Taro Kono exchanged views on the South Korean top court’s recent rulings that ordered Japanese firms to compensate South Korean victims forced into labor during Japan’s occupation of the Korean Peninsula. “Minister Kang explained our government’s position on the rulings and urged a prudent response from Japan. The two ministers will continue to closely communicate with each other from now on,” the ministry said in a press release. Relations between South Korea and Japan have soured since the Supreme Court ruled that Japan’s Nippon Steel & Sumitomo Metal must compensate four South Koreans forced to work at its steel mills during Japan’s colonial occupation. A separate ruling last month in favor of 10 South Koreans forced into labor and Seoul’s announcement to disband a Japanese-funded foundation aimed at supporting South Korean victims of Japan’s wartime sexual enslavement further worsened their relations. Japan has fiercely hit back, with high-ranking officials and lawmakers denouncing the rulings as unacceptable and signaling tough countermeasures. Under the treaty that settled colonial-era issues, South Korea restored diplomatic relations with Tokyo in return for a reparations package of $500 million in grants and low-interest loans that contributed to Seoul’s economic takeoff. Seoul, which has said it respects the judiciary’s decision, set up a body comprising government officials and outside experts under Prime Minister Lee Nak-yon’s office to draw up follow-up measures. Wednesday’s phone call between the top diplomats is a “positive” signal, according to an official from Seoul’s Foreign Ministry. “The tough rhetoric, tough protest (by Japanese officials) have abated a little bit (recently), compared to days right after the first ruling (on forced labor) on Oct. 30,” the official said. “As I see it, the Japanese government also maintains its support for the two-track approach,” the official added. The Moon Jae-in administration has pursued a “two-track approach” of separating historical issues from other bilateral issues on security, economy and culture. Both countries seek to prevent the spat over their shared history from hurting bilateral relations in order to develop forward-looking relations. Lee Su-hoon, Seoul’s ambassador to Tokyo, agreed that bilateral ties are in a “rather grave” situation. “But everybody would agree that the cooperative relations between the two countries for future-oriented development shouldn’t be marred by these issues,” he said at a press briefing in Seoul, stressing a “cool-headed” and “restrained” attitude.